This work is part of a series on landscapes drawn from the West of Ireland. It was based on a place on the road to Oughterard, which is a quiet forested bogland area. McLoughlin attempts to catch the moment when the light is just about to disappear, and the colours in the sky seem deep and intense and full of possibility. 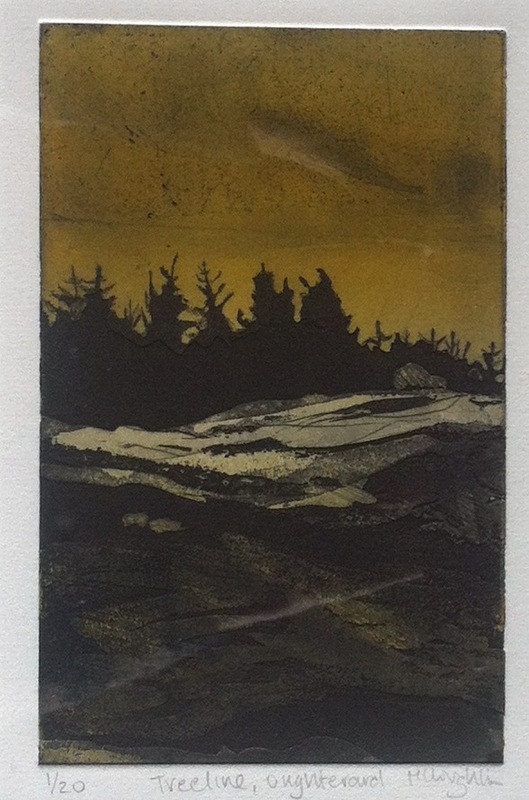 Margaret McLoughlin is an Irish printmaker working in the Black Church Print Studio. Her work deals with the wild boggy landscapes of Leitrim and Galway. She has had several solo shows and exhibited both in Ireland and abroad in group shows, (including RUA, RHA, Oireachtas, etc).